Will Our Descendants Think of Credit Cards As a Failed Experiment? Are credit cards a failed experiment? Okay, it's true. I once (in the late 1990s or early 2000s) slept with the late Princess Margaret, sister of the current British queen. There, I've said it. The secret's out, and I feel much better now that it's in the open. To be fair, I'm not altogether sure that Her Royal Highness nodded off. I certainly did, but, at the time, she was in the royal box at the Albert Hall in London, England, and I was at least 70 feet away in the stalls. We were both witnessing an experimental ballet being performed by a touring company who should, frankly, have stayed at home. As experiments go, it failed, and it seems inconceivable that the Princess, alone among the audience, remained awake throughout the entire, seemingly interminable performance. I know this is going to make me sound elitist and pretentious (though actually it has more to do with an inability to turn down invitations to events months in the future from friends who think I'm way more cultured than I am), but last week I was at the state opera house in Budapest, Hungary, and saw a 150-year-old experiment that also failed. Just a little way into one of the key arias, a very strange noise emanated from somewhere to the left of the conductor. It drowned out the soprano, and sounded a bit like the sort of street organ that you might have heard at Coney Island a century or more ago. But a peek into the orchestra pit during an interval revealed no monkey with a cup. Instead, there was an instrument I'd never seen before. I guess it was one of many such music-making devices that gained instant popularity among Victorians and then, a decade or two later, equally quickly disappeared. Could credit cards similarly prove to be a failed experiment? All this pondering failed experiments stirred a new thought: Might our great-great-grandchildren look back on credit cards in their current form, and think we were crazy to use them as many of us do? Of course, they'd understand many aspects of plastic's appeal. They'd certainly get its convenience as a method of payment. And they'd appreciate the usefulness of the statutory protections that make credit cards almost always the safest way to make a purchase. They might also recognize the great deals offered by many rewards credit cards. However, they may be less naive than many of us are over who pays for those deals. Perhaps they'll know that the goodies that rewards credit cards provide are funded not only by the cards' annual fees but also by the interchange fees that credit card companies charge merchants every time a card is swiped, and that those are generally passed on by merchants to all their customers, including the poor and the unbanked who pay with cash. Who knows, our descendants may even see those fees as a form of private-sector sales tax. But if future generations do decide that we were insane to use plastic in the way many of us today do, it's likely to be the credit rather than the cards to which they object. Of course, people have been borrowing since before money was invented, and philosophers, politicians and scripture writers have been warning against the dangers of doing so for very nearly as long. So it's highly improbable that humanity is going to kick the habit over the next couple of centuries. What they might question is the widespread current willingness to take on rolling credit obligations. In other words, our readiness not to borrow to buy something, but to borrow to buy anything. There's an important difference here. You could argue that all debt is an attempt to live beyond one's means. There was a time when mortgages were regarded to be as great a disgrace as any other borrowing. But in the 20th century we began to differentiate between "good" and "bad" debt, with home, student and, perhaps, auto loans being perfectly acceptable. Many would acknowledge that there are times when a little credit card debt is also fine, especially when it's an investment in future earnings, such as an unemployed person buying a much-needed new outfit for a job interview. The trouble is, too many of us have given up on that differentiation between good and bad. 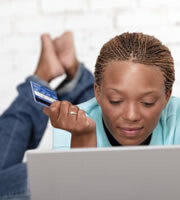 IndexCreditCards.com recently estimated that the average household with average credit card debt carries over $15,000 on their credit cards. At the time of writing, the IndexCreditCards.com credit card rate monitor says that the average APR for consumer credit cards is 16.87 percent. So a household paying average rates on average card debt is looking at over $2,500 a year in interest alone, which is over $200 a month just in interest! That's on top of taxes, mortgage/rent, insurance, auto loan, student loan, heat and light, phone, gas, food and all the other necessities of the real world. We've created a society in which that sort of thinking has become normalized and is, indeed, encouraged. The relentless pressure to think positively in modern America -- and elsewhere -- has killed the rational assessment of risk. So people airily assume that something (a promotion, a lottery win, an inheritance… just a windfall out of the blue) will come along to make everything all right. Some people appear to view credit card companies in the same way that gambling addicts see casinos. They know the math can't possibly add up, but they go ahead and stick their necks in the noose regardless. Come to think of it, if our great-great-grandchildren don't end up regarding credit cards as a failed experiment and our current use of them as madness, they're going to be living in a society that's as screwed up as ours. If your credit card debt's gotten out of hand, and you're having trouble sleeping, I can recommend the perfect ballet for you. 1 Responses to "Are credit cards a failed experiment?"